Tarun Gupta May 27th, 2013 Web Development no comments. For an organization, customers are decisive factors who decide the fate of the company in the market. The relationship between a company and its customers plays a significant role in deciding the emphasis of the business ventures. That is when a customer relationship management solution or a CRM Solutions comes at work. If experts are to be believed, CRM is an essential business philosophy that offers a comprehensive vision and a thought process to define the communication channel between a customer and an agency. CRM Application Development therefore integrates all the modules inside an organization. For most of the business organizations, this strategy gives shape to sales and marketing channels. It helps to maximize the value of relationships. Before indulging in the detail of software solutions for CRM, let's get an idea what is customer relationship management is all about. A number of new technologies have revolutionized the spectrum and invented new strategies to implement the CRM products in the most feasible manner possible. A software or application made for the purpose helps to integrate and manage cross-departmental processes. Most of the CRM applications do focus on a few aspects of the implementation cycle that results in decreased consumer satisfaction. While developing a custom CRM solution, custom web development professionals take care of all the elements that play a significant role during the interaction cycle. Experts' take help of various media such as website, email and inbound and outbound telephone calls to initiate the interaction. Most of the business organizations want to implement a customer interaction center inside the premises, that is where the significance of CRM arises.To accomplish the purpose, Vtiger CRM brings good number of utilities and features. Experts in CRM development manage the operational CRM Solutions when it requires to add functionalities such as order processing and the back office applications.The key responsibilities of these experts are to integrate these systems with existing marketing, customer service and support suites running inside the organization. To bring the thing in the right direction, the most innovative SUGARCRM helps business owners a lot. In technical terms, a customer relationship management is an extensive business strategy that helps organizations to become more customer oriented and service centric. An organization that tenders more values and priority to the customers, get the advantage of a well-managed CRM software to efficiently manage sales, marketing and customer service channels together. Software development for CRM enables decision makers to take the right decisions to manage employees and customers efficiently. An experienced web development company develops CRM applications for every organization. Whether you are a small organization needs a cloud CRM technology are a big corporation that needs business applications to be integrated together, a web based CRM solution is the perfect answer. Efficient marketing to existing campaigns. Enable real-time access to customer data repository. Access up to date pricing, marketing and sales information for the sales team. Giving more time to sales team to creating and closing opportunities. Faster issue resolution and instant customer service. A CRM software module helps business houses to generate various reports very quickly and efficiently. It leads to a number of advantages in terms of data warehouses building and discharge of critical business decisions. Listed below are the various decision making advantages of customer relationship management solutions. Asses, assign and track the leads. Better management of revenue, profit and cash flow. Customer database management for focused marketing campaigns. Positive modifications in lead generation tactics. Being an online business owner you can either choose a web based CRM or an on-site CRM, all it depends upon your individual business requirements. For small business owners a web based solution is the best one and in contrary, for a big organization, on-premise solutions are most preferable with its ability of customization and configuration. 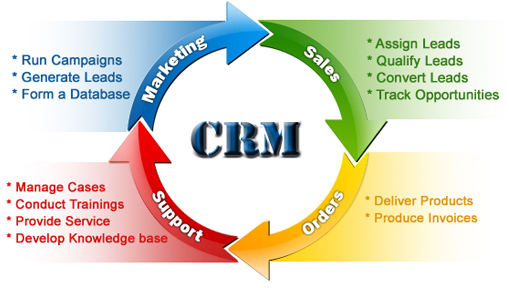 CRM Development offers various business functions in a row. Measurement and evaluation of key customer influencers and other constituents. Implementing and tracking of key performance indicators such as revenue and order tracking. Maintenance of the sales pipeline for better financial management. Creation of targeted marketing lists. Tracking and managing the accumulated responses. Trigger specific responses based on various criterion. Reduce duplication and data redundancy. Creation, management and resolution of core issues. Delivery of notifications and alerts. Publish, store, and access information repository. Although an automated solution offers a number of business benefits to the organizations in terms of productivity, scalability and customer retention, it is very important to Hire Dedicated Web Developers who have experience in CRM development or ask quotes from service providers with competence in the vertical.